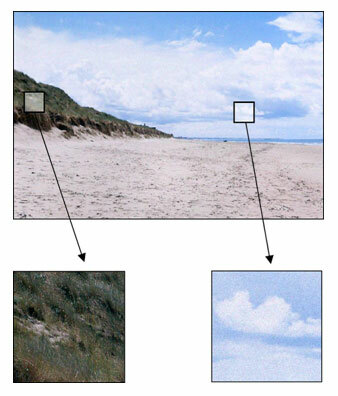 Noise in an image is described as random granulation that is particularly visible in uniform areas. Noise in a landscape photo. Note that the noise is considerably more noticeable in the more uniformly-colored patch of sky in the enlargement at right. Photonic noise: Classical light sources produce random variations in luminous flux which, after deflection in the optical system, produce the most common form of noise in photographic images. Thermal noise: Sensors can generate random signals due to the effect of ambient temperature. Transfer process noise: The process of charge transfer may be incomplete or interfere with adjacent photosites, thereby generating noise. Standard deviation of noise represents the dispersion of gray levels around the mean gray level, and is expressed in gray levels (GL). where is the mean gray level measured in the patch. SNR is independent of any gain applied to the signal since signal and noise are equally amplified. Noisy images with increasing standard deviation of noise (left image SD=2, center image SD=4, and right image SD=9). Dynamic range is defined as the ratio between the highest and lowest gray luminance a sensor can capture. However, the lowest gray luminance makes sense only if it is not drowned by noise, thus this lower boundary is defined as the gray luminance for which the SNR is larger than 1. The dynamic range is a ratio of gray luminance; it has no defined unit per se, but it can be expressed in Ev, or f-stops. Since tonal range is a number with no unit, one can consider instead , which represents the number of bits necessary to encode all distinguishable gray levels.